Most of us have struggled with weight at one time or another and are well aware of how important regular exercise and a proper well-balanced diet are to our weight loss success. But not everyone is paying attention to their sleep patterns in regards to weight loss. Odd as it may seem there is strong evidence that sleep or the lack thereof strongly contributes to the obesity epidemic. In fact, lack of sleep is gaining recognition and attention as a primary reason that weight loss efforts are impeded or fail altogether for many people struggling to lose weight. A recent study was conducted on participants randomly assigned to sleep either 5 ½ hours or 8 ½ consecutively for 14 nights in a row. All their diets were trimmed by 680 calories and they all slept in a lab. Those who slept for 5 ½ hours lost 55% less body fat and 60% more of their lean body mass than those who slept longer. The study shows that sleep deprived people lost muscle but held onto fat tissue…not the way you want to go. On a larger scale, researchers looked at 36 different studies on 635,000 people from all over the world and the results found were that adults who did not get enough sleep were 50% more likely to be obese while children who don’t get enough sleep are 90% more likely to be obese opposed to those who did get the sleep their bodies required. Although research has proven that lack of good sleep does indeed impact weight loss success, the exact way that lack of sleep contributes to obesity is just beginning to be studied and understood. So far studies reveal that lack of sleep affects parts of the brain in control of pleasure eating. Not surprisingly, hormones also play a significant role. Leptin, ghrelin, cortisol and orexin all hormones involved in eating or appetite in some way are affected by lack of sleep. Once you get your hormones working against you in the weight loss war you might as well consider yourself in a real battle. The delicate balance of your hormones is nothing to mess with…it can take months and sometimes years to get balanced again. Additionally, loss of sleep affects how your metabolism operates. It may not be able to process and metabolize carbs as well causing more fat to be stored in your cells resulting in increased levels of blood sugar. Lack of sleep also translates into lack of energy. When have you ever felt high energy after experiencing a “bad” night’s sleep? Bottom line is this…weight loss varies considerably for each individual and weight management overall needs to be taken seriously with a good understanding of what causes weight gain in the first place followed by an explanation of the barriers working against weight management. 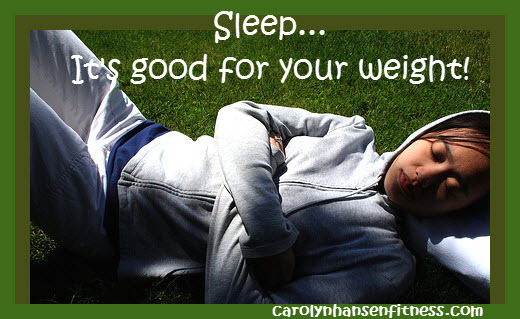 It is important for those conducting weight loss programs (coaches, teachers, instructors) to include the importance of quality sleep as a valuable and important tool in the weight loss war…one that will affect the success or failure of weight loss. Lack of sleep is not the single solution to why people are struggling with weight loss and obesity, however increasing evidence is pointing to the fact that sleep habits can no longer be overlooked in the struggle to take weight off and keep it off. We need to get our “beauty sleep”…and now we can feel good about it! If you are ready to win the weight loss battle once and for all but lack the proper mindset and knowledge, don’t get discouraged, get help… “Rebound Free Weight Loss” was created just for you.